Karuta is a traditional Japanese card game around a theme using like-a haiku clue cards and the answer (eg. a picture) on separate cards. 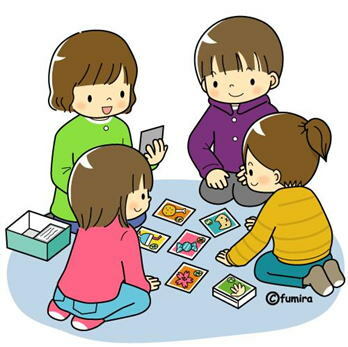 Karuta has been created on various themes such as proberbs, local community, history, and environment so that people can expand knowledge of the themes while having fun playing . Karuta is an active game in Japan. New themed Karuta cards show up every year and Karuta game competitions have been held at school, in communities nationwide in Japan. “uta-Karuta ” is typically played with clue(5 line poem) cards and the matched cards of the last 2 lines of the poem. 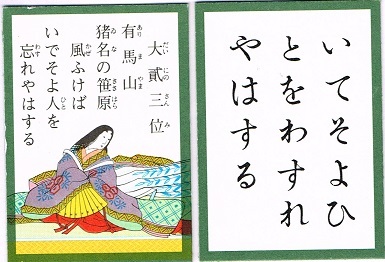 “Hyakunin Isshu Karuta is a well-known uta-Karuta using 100 clue cards with 100 classical poems by 100 poets. 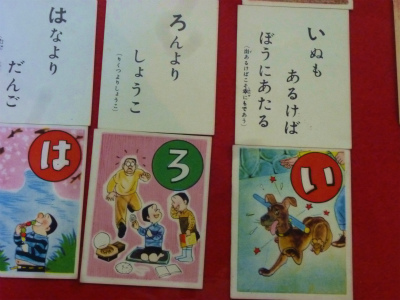 Hyakunin Isshu Karuta is played by children at elementary/junior high school level as part of lliteracy curriculum. The competition using Hyakunin Isshu Karuta has been held nationwide and national championship tournament is held every January. Iroha is a kind of Japnaese alphabetical 46 letters. iroha-Karuta is played with 46 clue cards and the matched 46 answer(picture) cards. The first letter of each clue is typically printed on the corner of the answer card. The famous iroha-Karuta is of a theme of proverbs.played with for 46 clue and 46 answer cards. strengthening community spirit through people coming together to take part in Karuta tournaments. They have held Karuta tournament on prefectural level since 1947. We, FROM JAPAN Institute, developed over 20 English version of Karuta sets which are based on “iroha-Karuta ” style which means alphabet letters in English. It is played with A-Z, 26 clue cards and 26 matched answer(picture) cards. The first letter of each clue is printed on the corner of the answer card. Karuta can be played by 2-6 people with a card reader/referee. Spread the answer cards face up on the table/floor mat. Sit around the answer cards. A clues is read out and look for the matched answer card. Touch the correct answer card before anyone else can. The first player to touch the correct card wins the card. Continue the game until the last two cards are left. This is the last turn. Whoever wins takes both cards. The winner is the player with the most cards.